Registration for the 2018 Judo Alberta Female Training Camp is now open! This years camp will feature special guest Bianca Okedahl who has represented Canada in many national and international events such as Paris Grand Slam, Tokyo, Abu Dhabi, Samoa, Belgium Ladies Open. Before retiring in 2011, she was ranked 37th in the world in the under 48kg category. Time: Saturday March 17, 2018 Registration and welcome is from 11:30-12:30pm, Pick-up time is 12pm on Sunday March 18. Payment due with release forms. There are no age or belt restrictions so long as you are a member in good standing with Judo Alberta or another provincial judo association. Judo techniques and strategies will be presented from a female perspective. As well, this is a great opportunity for girls to get to know each other and spend some time with other female athletes. To view the registration package please click here! Congratulations to everyone who competed at the 2018 Judo Alberta Provincial Championships this past weekend! We would also like to thank the Tolide Judo Club and all of the volunteers that dedicated their time into hosting this great event. 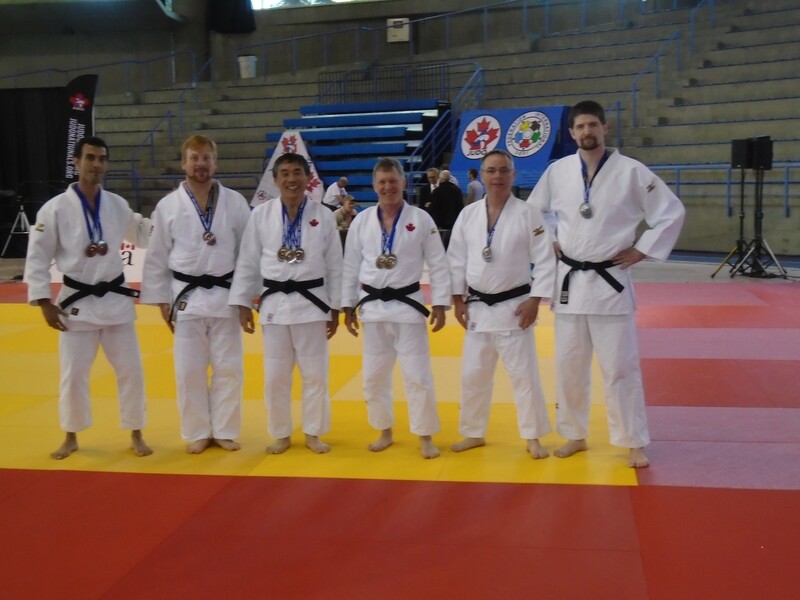 Congratulations to Rashad Chin of the Kodokwai Judo Club for winning the Judo Alberta Grand Championship title! Montreal, February 10, 2018 – Christa Deguchi (-57 kg) surprised everyone with a perfect day on Saturday at the Paris Grand Slam, in France. She won the final by ippon against Tsukasa Yoshida, from Japan, and won Canada’s first ever gold medal at the prestigious judo tournament. Formerly representing Japan, Degushi started fighting for Canada last fall. This gold medal at the Paris Grand Slam is not only the first one for Canada; it also has a special signification for the athlete, who won against a Japanese opponent. “I lost twice before against Yoshida, so this was my revenge. I am happy that I’ve won for Canada and it was really nice to hear the Canadian National Anthem after my victory. I won a tournament last week and I really wanted to win today too, so I feel good. I just changed my nationality, and I want Japan to be afraid of me. It felt really good to beat them,” said Deguchi. The 22-year-old won by ippon against French Hélène Receveaux in the semi-final, in a very short bout that lasted 26 seconds. In the preliminary rounds, she won against Manon Durbach from Luxembourg, Youjeong Kwon from South Korea, and Timna Nelson Levy from Israel. “For Christa this is a great result. 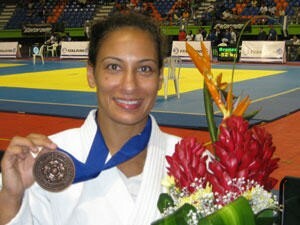 She is the first female athlete to win the Paris Grand Slam in Judo Canada history. She finishes her European tour with two back-to-back gold medals. I believe these results will give Christa a lot of confidence for future competitions,” commented her coach, Sasha Mehmedovic. Arthur Margelidon (-73 kg) lost in the quarterfinal against Kosovar Akil Gjakova, after winning his first 2 fights in the preliminary rounds. He had to go through repechage, where Swedish Tommy Macias won by ippon after 18 seconds. In the final for the bronze medal, Changrim An, from South Korea, also won by ippon. Antoine Bouchard (-73 kg) and Stéfanie Tremblay (-63 kg) both had 1 victory and 1 loss. Bouchard, who finished in 17th place, started his day by winning against Chinese Daga Qing, but then lost against Georgian Lasha Shavdatuashvili. Tremblay won her first fight by ippon against French Yasmine Horlaville before losing against Japanese Miku Tashiro, and finished in 9th place. In the under 52 kg category, Ecaterina Guica lost her first fight and didn’t get a ranking. Malcom Pelletier (-60 kg) and Bogdan Jora (-66 kg) finished in 7th and 9th place in their categories at the Cadet European Cup in Follonica, Italy. Pelletier won his first 3 bouts by ippon in the preliminary rounds. He lost his fourth fight against Daniel Detari, from Hungary, and went through repechage, where he won against Greek Vasileios Briolas. The Quebecois lost his second bout in the repechage against Spanish Daniel Gallego Saez. Jora finished in 9th place in his category. He finished his day in repechage, where he lost against Estonian Deniel Nuriev. He had 2 victories and 1 loss in the preliminary round. He won his first fight by waza-ari in the repechage, against German Tom Moritz. Arno Blacquière (-55 kg) had 1 victory and 1 loss. Andrée-Ann Somers (-44 kg), Sarah Maloum (-52 kg) and David Teper (-55 kg) all lost in the first round and didn’t get a ranking. Saturday March 17, 2018 Registration and welcome is from 11:30-12:30pm, Pick-up time is 12pm on Sunday March 18. To view the registration form please click here. 2018 Open Nationals Qualification Update: Including this camp there are two more Open Nationals Qualification Provincial camps in Alberta. U16/U18/U21 athletes need to participate in 3 training camps in the season to be eligible for nationals. Seniors only need to participate in 1 training camp. Competition Minimums: 20 matches or 4 competitions for U16 and 5 competitions for U18/U21/Senior. Talk to your coaches/clubs regarding your status. 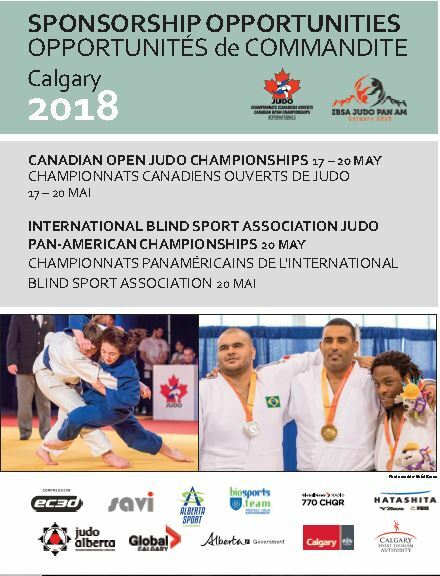 From May 17-20, 2018 the 2018 Canadian Open Judo Championship and IBSA Judo Pan-American Championship being held in Calgary, AB. The local organizing committee is currently accepting sponsors to help support this prestigious national event. To learn more about the ways in which you can become involved please click here to view the sponsorship package. If you have any questions please contact judo@judoalberta.com for more information. 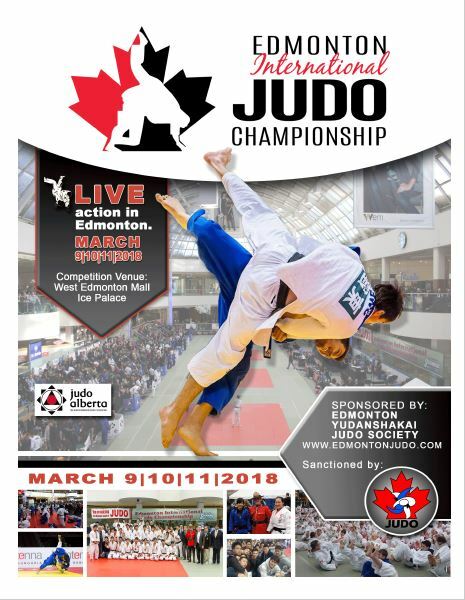 In the time period between March 9th and 12th, 2018 the 13th edition of the Edmonton International Judo Championship and Judo Symposium is taking place in the centre of the largest indoor mall and entertainment centre in North America. The Edmonton Yudanshakai Judo Society, Judo Alberta, and Judo Canada would like to encourage athletes, coaches, referees, parents, and club administrators to come to Edmonton, Alberta, Canada to participate in this event. It is our belief that our ALBERTA Judo tournament, which attracted 925 participants in 2017, will provide all athletes in attendance a tremendous opportunity to obtain a volume of valuable, high quality, national and international competition experience in an extremely safe environment. Our location and the associated infrastructure supporting Edmonton, ensures ease of access to the city, and the venue, while at the same time it limits travel costs and associated time zone issues that sometimes plague competitors interested in competing in large tournaments. For Canadian and American athletes, far and wide, there is an ease of travel to Edmonton. We would ask that you share this information with your many judo friends in other locations. We believe that the tournament’s multi day format also facilitates travel time for all participants, no matter where they are from, and our mat system ensures an organized flow of events for every competitor. We are pleased to advise that as a result of the historic success of our tournament product offering we are already receiving multiple inquires from judoka from various countries interested in participating in this year’s Edmonton International. Our venue is like no other judo tournament in the world, and our schedule also ensures that participants, coaches and families have the opportunity to partake in the special events aspects of the largest indoor shopping and entertainment center in North America, West Edmonton Mall. This facility with over 800 stores, 110 restaurants, the world’s largest indoor amusement park, world’s largest indoor water park, a casino, an entertainment centre, and much more, ensures that all members of your entourage will be entertained. For those not in attendance these past few years please visit www.westedmontonmall.com for more details of the ancillary benefits of the West Edmonton Mall venue. From a judo perspective, we believe our location provides a unique opportunity for the display and understanding of our sport, as a result of the 100,000 + people per day walking around the enclosed but open air tournament site. Please review our website www.edmontonjudo.com for pictures of this very dynamic tournament environment. The mid of March is a perfect time to participate in our judo event. The Tournament and associated workshops have proper judo activity for every taste and interest. You can come to Edmonton with your team, family or with your judo friends from all over, and feel that Judo is more than just sport. As stated, more than 925 athletes experienced that in 2017 and we expect that similar participation in 2018 from your fellow judoka who will be joining you this spring in Edmonton. For many it will be a meeting place of old friends, consolidated by a long friendship in judo. Friday Afternoon from 2 to 3:30 pm, a Judo camp for children U16 and down where the younger judokas will be introduced to the mysteries of judo. We encourage all instructors to join us on the mats for this. For 2018 our youth will not only participate in a massive tournament but will be have the opportunity of meeting and being instructed at this tournament specific Friday training event by USA Olympic silver medalist Travis Stevens who is bringing with him a large group of competitors to compete at this year’s Edmonton International. Travis understands the value of youth in our sport and has offered to be a guest instructor in this afternoon event. It will be a special time for the youth of our sport, and it is these moments that help cement desire and commitment into the young minds about our sport. With fresh rules for our sport now in place we have put together a top notch Referee Symposium with panel members fresh from the Pan American IJF referees clinic. This event will take place Friday evening in the conference room of one of our host hotel, the Executive Inn, to ensure all referees, coaches and fighters are fully aware of today’s judo rules. In conjunction with Judo Canada, we are providing Live internet broadcasting of every mat. We have arranged hotel packages for participants and members of their travel teams which are included in the tournament package and on our website www.edmontonjudo.com, additional hotels will be coming online shortly so check back regularly to our website for further selection should the three in this present package be sold out. Additionally, any further information or tournament package revisions will be uploaded on our website as they become available. If you have any questions in the short term I would be pleased to respond by email. Please mark your calendars, adjust your budgets, and plan to travel this March 9th. 10th and 11th 2018 to the Edmonton International Judo Championship, truly a unique and outstanding Judo tournament experience. We would ask that you share this information with your many judo friends in other locations. Late Registration closes March 3, 2018 at 23:59 MST; No registrations will be accepted after March 3, 2018. The 2018 Judo Alberta Provincial Championships being held on February 10th, 2018 at the Tolide Judo Club (8700 84 St, Fort Saskatchewan, AB T8L 4P5). Please note that this event is a mandatory Team Alberta event. All registrations must be received no later than January 31, 2018. If you are registering a club list, each athlete will require an email address for the waivers to be sent to. If under 18, it needs to be a parent email. Over 18 it will be their email so they can confirm. Payments will still need to be mailed. To view the registration spreadsheet please click here. Keith Bibbey and Wes Enns are hosting a clinic for anyone interested in Kodokan Goshin Jutsu (Forms of Self Defense – this kata focusses on techniques against Unarmed and Armed attacks). Registration: $20.00 at door or $25 if you are attending both Saturday and Sunday. Knifes, Sticks and Guns will be available if you need to borrow one.